The most sought-after design on gold bars for sale is that of Lady Fortuna. A depiction of the Roman goddess of fortune, Fortuna was developed by PAMP Suisse as the first-ever intricate design used on a bullion bar. Today, 10 oz PAMP Suisse Fortuna Gold Bars are available to you online from JM Bullion. Available to you inside of protective assay packaging! Contains 10 Troy oz of .9999 pure gold. On the obverse is Fortunas portrait. The reverse includes the refinery logo and other important markings. Comes with Veriscan technology from PAMP Suisse. The Fortuna design was the worlds first intricate design on silver or gold bullion bars. While coins are common with intricate designs, investment-grade bullion bars previously featured only markings of the refinery logo, an assayers signature, and the weight of the bar. All of the 10 oz PAMP Suisse Fortuna Gold Bars in this product listing from JM Bullion are available to purchase in new condition housed within protective assay packaging. PAMP Suisse assay packaging includes Veriscan technology that enables the buyers to validate, on their own with a QR code, the gold bullion theyve purchased. 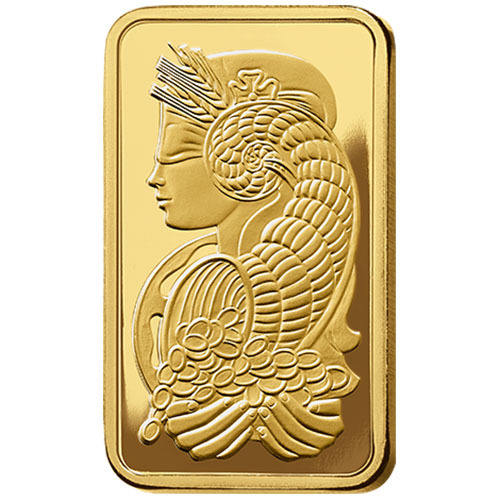 The obverse side of 10 oz Fortuna Gold Bars includes the image of Lady Fortuna. The Roman goddess of fortune, she was worshipped in Roman religion too as a symbol of luck. Her figure is featured here in left-profile relief with a crown wreath on her head and blindfold over her eyes. The cornucopia featured on her figure winds down to the bottom of the design where her open hands collecta wealth of coins falling from the horn. Fortuna took many forms in Roman society. Though she was best known as a goddess, her powers ranged from a focus on fortune to concepts of fate and luck. It is said that she could bring both good and bad luck to her worshippers. 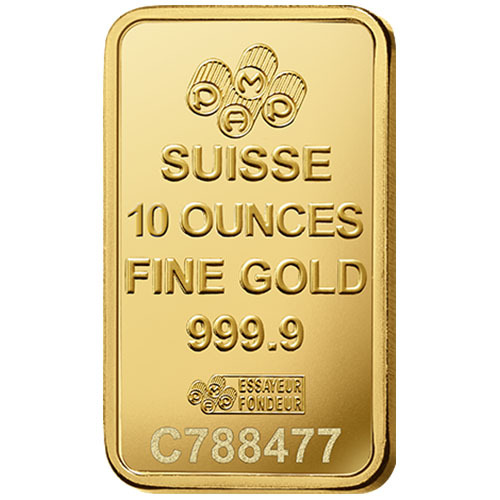 On the reverse side of 10 oz PAMP Suisse Fortuna Gold Bars are basic engravings. Arranged horizontally down the face of the bar, these engravings include the logo of PAMP Suisse, the weight, metal content, purity, and individual serial number of the bar. There is also an assayers mark on this side of the bar. PAMP Suisse is widely regarded as the worlds leading bullion brand. Founded in Ticino, Switzerland in 1977, today it is part of the MKS Group out of Geneva, Switzerland. Please feel free to reach out to JM Bullion with any questions you might have today. You can call us at 800-276-6508, chat with us live online, or simply send us an email.